The instructions below assume you are using Windows 10. You can use VMware on the Mac and other operating systems, but the steps may be somewhat different. If you are working in S214, select a machine to be your primary machine for the semester. You'll want to keep using the same machine as much as possible, because your virtual machines will be there. Power on your computer. Boot to the operating system named "Win 7-S214". Log on as Student with no password. Click Start, "File Explorer", "This PC". Find the "VMs-S214" drive and double-click it to open it. In the VMs-S214 window, right-click the empty space and click New, Folder. Name the folder "YOUR NAME VMs" replacing YOUR NAME with your own name. Download the "Kali Linux 32 bit VM PAE" file, as shown below. Right-click the Kali-Linux-2.0.0-vm-i686.7z file, click 7-Zip, and click "Extract Files...". In the "Extract to:" box, enter the path to the folder you prepared, such as "G:\YOURNAME\Kali". Click OK.
Start the Attacker Linux machine in VMware Player. If your Kali virtual machine won't start, you probably didn't extract both compressed files. This is a very common mistake. You need all the files from both the ZIP archive and the 7Z archive in the same folder. In the VMware Player window showing your Kali Linux desktop, on the top left, click Player, Manage, "Virtual Machine Settings". In the "Virtual Machine Settings" box, on the left side, click "Network Adapter". On the right side, click "Bridged: Connect directly to the physical network". 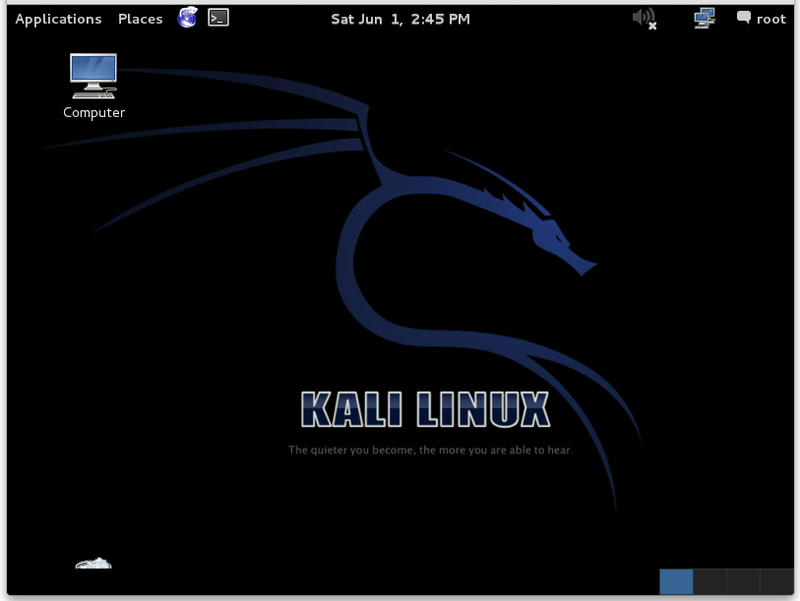 Click OK.
At the top left of the Kali Linux desktop, click the rectangular black icon to open a Terminal window. 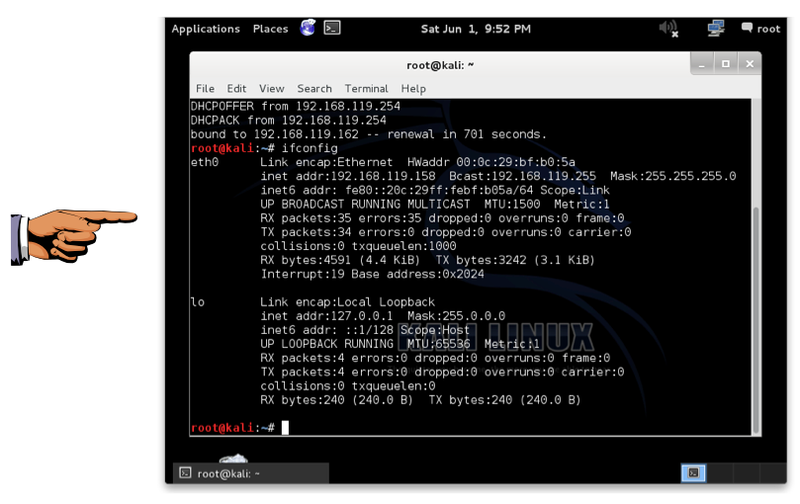 Make sure the Kali Linux desktop is visible showing your IP address. Click the taskbar at the bottom of your host Windows 7 desktop, to make the host machine listen to the keyboard, instead of the virtual machine. Press the PrintScrn key in the upper-right portion of the keyboard. That will copy the whole desktop to the clipboard. On the host machine, not the virtual machine, click Start. Type mspaint into the Search box and press the Enter key. Click in the untitled - Paint window, and press Ctrl+V on the keyboard. The desktop appears in the Paint window. Save the document with the filename "YOUR NAME Proj 10", replacing "YOUR NAME" with your real name. Email the image to me as an attachment. Send it to: cnit.120@gmail.com with a subject line of "Proj 10 From YOUR NAME", replacing "YOUR NAME" with your real name. Send a Cc to yourself. In the VMware Player window, in the upper right corner, click the X. A box pops up, offering three choices, as shown below. 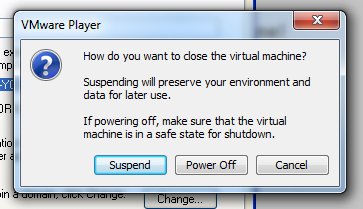 Suspend freezes your VM in its current state. This is usually the best choice. Power Off is only for emergencies, when the guest operating system has crashed. It's the equivalent of pulling out the power plug on a real computer.